The Choetech Fast Wireless Charging Pad is an affordable way to charge your phone wirelessly. But it's slower than many of its competitors and heats up quite a bit in the process. When it comes to picking a wireless charger, you have the option of a stand or a pad. Both will charge your device wirelessly, but the stand will keep your phone propped up for easy use, while a pad like the Choetech Fast Wireless Charging pad leaves it lying flat, making it easier to grab. As an entry-level option the Choetech charging pad fares decently when it comes to design, though we had issues with its relatively slow charging speed. The Choetech Fast Wireless Charging Pad is a compact puck that charges your phone inductively when you place it atop. The charger is only 0.3 inches thick and 3.6 inches in length and width, giving you a relatively small surface to place your device. One of the best features of its design is the black matte finish that keeps fingerprints off. Other devices are more plasticky, leaving scratches and prints when you handle them. The anti-slip rubber allows the charger to stay steady on a table and keeps your phone safe from slipping off. On one side of the pad, there’s an LED indicator that shines green when the phone is connected, letting you know the device is charging. There’s not a lot required to set up the Choetech Fast Wireless Charging Pad. Inside the box, you’ll get the pad, a manual and a micro USB to USB-A cable. You will have to bring in your own power brick to connect to the electricity and power up your pad. Once you have everything connected, set your phone on top of the pad and a green light should turn on indicating your device is powering up. One of the best features of its design is the black matte finish that keeps fingerprints off. To test the Choetech Fast Wireless Charging Pad we fully depleted an iPhone XS Max, let it rest for about 30 minutes so it cooled down, and made sure there was no juice left. Once we placed the phone on the mat it took about 3 and a half hours to reach 100% battery life again, which is more than we anticipated. Throughout the charging, we noticed both the smartphone and the charger get warmer than other pads we’ve tested out. It wasn’t to a point where we worried that it would get too warm and explode, but getting to high temperatures regularly could really cause a problem as the phone battery ages. Choetech claims that it protects your device from over-charging, over-voltage, and overheating, so hopefully, that should help mitigate this somewhat. Fast wireless charging up to 10W is reserved for Samsung Galaxy S9, S9 Plus, S8, S8 Plus, Note 9, Note 8, S7, S7 Edge and S6 Edge+, 7.5W charging is for iPhone X/ XS / XS Max/ XR/ 8/ 8 Plus. For both, you’ll need a compatible AC adapter to fast charge. Other Qi-enabled smartphones are supported but will charge at 5W standard rate. The pad is capable of charging your phone with a case no thicker than 4mm, but the manufacturer advises that for best results you charge with no protector on your device. The Choetech Fast Wireless Charging Pad costs under $20, coming in as one of the least expensive wireless chargers on the market. The pricing is affordable for anyone that has a Qi-enabled phone and wants to be able to buy multiple chargers to have around the home or office without breaking the bank. The Choetech Fast Wireless Charging Pad is a fantastic product that charges your phone while letting you ditch the cord. It’s also worth pointing out is that, as of right now, Apple doesn’t have its own branded charger for wireless charging. That makes the Choetech and inexpensive alternative that actually lets you take advantage of this feature. The Choetech Fast Wireless Charging Pad has major competition, not just from other pads, but stands. At the end of the day, it depends on what you are looking for. Charging pads are good if you don't use your phone much while it charges, while stands are more versatile as you are still able to interact with your device sitting at a desk while it continues replenishing your battery. Both products do the job they advertise in this scenario, the only major difference is the price. For about $15 you can buy the pad and for a few dollars more you can get the Choetech's fast-charging stand. The price difference is minimal enough that it depends on which design you prefer. Check out our guide to the best wireless phone chargers you can buy today. A decent budget option, but we wouldn't recommend it as your primary charger. 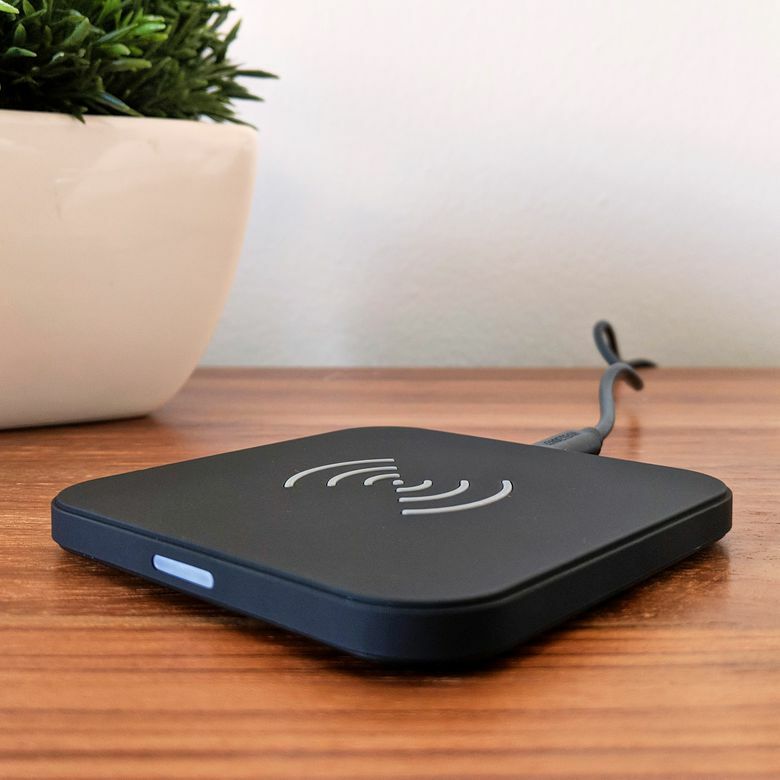 For budget-conscious consumers, the Choetech Fast Wireless Charging Pad is a serviceable—and somewhat slow—wireless charging pad with a low-profile look. The biggest drawback is the heat it generates during charging, which isn't great for your phone's battery life in the long run. Product Dimensions 3.6 x 3.6 x 0.4 in.